What are the IERS tables and how do I update them? What are IERS Bulletins A and B? How do I get IERS Bulletin A for astroplan? Keeping accurate, consistent time systems is rough. We intuitively want time to be described by a continuous cyclic clock like the clock on your wall or the calendar, but the Earth’s rate of rotation varies measurably on human timescales. As a result, the time measured by an atomic clock and the time that you would infer from measuring how long it has been since the last solar noon are constantly becoming offset from one another with stochastic changes in Earth’s moment of inertia and slowly acting tidal forces. For this reason, there is a time system that keeps track of seconds like an atomic clock, TAI, a more commonly used one that works like an atomic clock with a varying offset of some integer number of seconds, UTC, and one that matches up with the Earth’s rotation, UT1. The difference between UT1 and UTC is constantly changing as the Earth’s rotation changes and as leap seconds get added to UTC to compensate. In order to accurately predict the apparent position of a celestial object from the Earth, for example in altitude and azimuth coordinates, one needs to know the orientation of the Earth at any point in time, and since the Earth’s rotation does not change in a predictable way, we must rely on observations of the Earth’s orientation as a function of time to accurately calculate UT1-UTC. The International Earth Rotation and Reference Systems Service (IERS) is responsible for measuring the Earth’s orientation as a function of time, and making predictions for the Earth’s orientation in the near future (accounting for scheduled leap seconds). The data products released by the IERS used by astroplan are the IERS Bulletins A and B.
IndexError: (some) times are outside of range covered by IERS table. 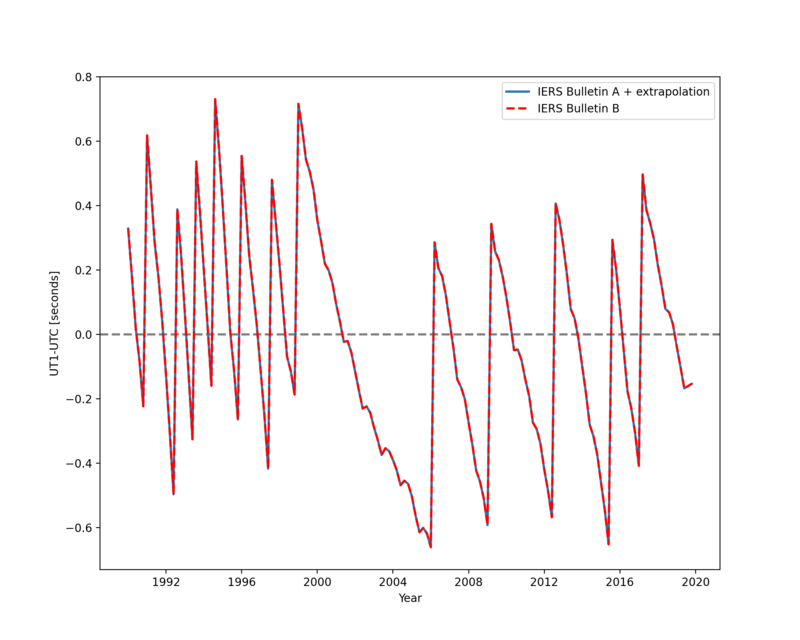 IERS Bulletin A encompasses the observations of recent Earth orientation contained in Bulletin B, while also making extrapolations into the past, before the Bulletin B tables begin, and into the future, after the Bulletin B tables end. The future predictions include leap second additions scheduled to be added. Without downloading IERS Bulletin A, astroplan simply approximates UT1-UTC=0 always. This will lead to lower precision position and time calculations on the order of arcseconds or seconds, and allow you to handle times in the far future and distant past.